Tower Paddle Boards Review - Adventurer 2 Awesome For Water Sports! Paddling will become one of your favorite sports with the Tower Paddle Board. You will be impressed by the sleek design and the attractive white and grey color. If you would like to know more about this product, please take a look at the complete review. Maximum weight capacity: This board can accommodate a maximum of 350 lbs. When it is fully inflated it will have the feel and performance similar to that of a hard board. Get maximum thickness: The majority of paddle board are made with a thickness of 4 ” and there have been problems with them bending and being hard to handle. This is not a factor with the “Adventuer 2″, made by Tower Paddle Boards. It has a thickness of about 6”which contributes to the rigidity of this paddle board when it is fully inflated. Solid construction: The board is extremely durable because of the flawless drop stitch construction and the double layer military grade material used to make it. No need to worry about the rocky shoreline or small debris floating in the water. Your board will glide right over it. Loads of accessories available: When you purchase the “Adventure 2” it does come with some accessories as well. On the nose and tail of the board are bungee carrying handles for your convenience. The package also includes a 3 piece adjustable fiberglass paddle, an air pump, along with a removable fin. If you decide to invest in this board you will not regret your choice after taking your first ride. This board is quite easy to store and you will have no problem transporting it. When you deflate it, you can easily roll it up like a sleeping bag and carry it in that manner. You could also find an old backpack around home and use it to transport the paddle board. Maintenance on this board is very simple, just rinse it off after each use. Once or twice during the paddle season, clean it off with soapy water and rinse, especially if you have been in some nasty water that could carry dangerous germ. This paddle board can be stored when inflated if that is a concern of yours. If you use it almost everyday, this would be the thing to do. Just be certain that you don’t store it in the hot sun. Leaving some products in the hot sun will cause the material to become weak and stretch. This could cause a weakening in the walls and stitching of the paddle board. One of the special features of the “Adventurer 2” are the 4 special D-rings that are attached to the front. This helps in securing a bungee cord used to handle the board easier. There is little need to worry about punctures in the board. The board itself is very small once you fold it up and pack it away. I would say it is the size of a rolled up sleeping back once you let all the air out and roll it up. This makes it really easy to carry under your arm. What’s really nice is that you can bring this along on vacations and save yourself on rentals because of how nice and compact you can store it. When winter comes for those of us that are so lucky, you can store this out in the garage or basement without any worries which makes it nice. If you buy a solid paddle board you better have plans to hang it in the garage or reserve space for it, because they do take up a lot of room! If something does damage this inflatable sup, it would probably cause damage to a hard paddle board also. If something would happen you can easily repair the punctures using a repair kit. All you will need is PVC glue and you will be able to attach a patch to the board without a problem. After a 24 hours drying time, the board will be good as new.
. The removable large fin is a high quality one and you can also upgrade the fin for river use as well. The pump is a standard quality pump that will serve you well. Additionally, you will get a 2 year warranty with this board. This warranty covers everything except normal wear and tear. When a product has a warranty, you can be sure it is a good one. Tower paddle boards are a smart investment and you can get it at a very affordable price. It has all the features necessary for some fun in the sun with your paddle boarding partner. 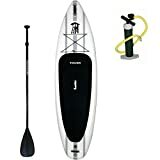 Click Here to get Tower Paddle Board from Amazon and check for the Best Price!